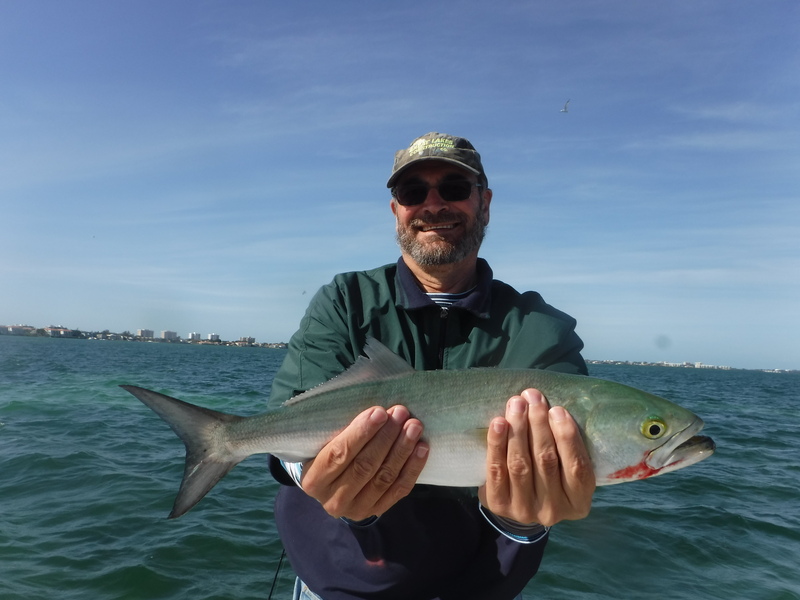 Bluefish action on Siesta Key! Bluefish fishing is well known to anglers who fish the Atlantic coast. Here in Sarasota, Florida, they do not grow as large but are hard-fighting, vicious gamefish. Lures catch a lot of fish as blues are attracted to fast moving baits, but live bait will also catch plenty of fish. Bluefish are found both inshore and in the Gulf, preferring areas of high salinity and clear water. Blues usually school up, so once they are located it is usually “Game on!” While bluefish are edible, they are strong and less desirable than many other species caught locally. Enjoy the battle and let them go to please other anglers. 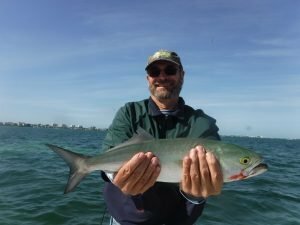 Big Sarasota Pass near Siesta Key and the surrounding grass flats hold plenty og bluefish when they are moving through. Blues are another pelagic species and are not found all season long, but when they are here they provide fantastic light tackle action! 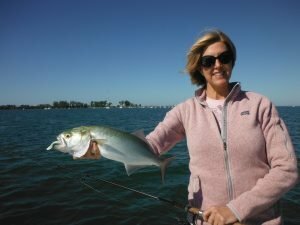 Most of the action for anglers bluefish fishing is found in Sarasota Bay on grass flats in six feet to ten feet of water. 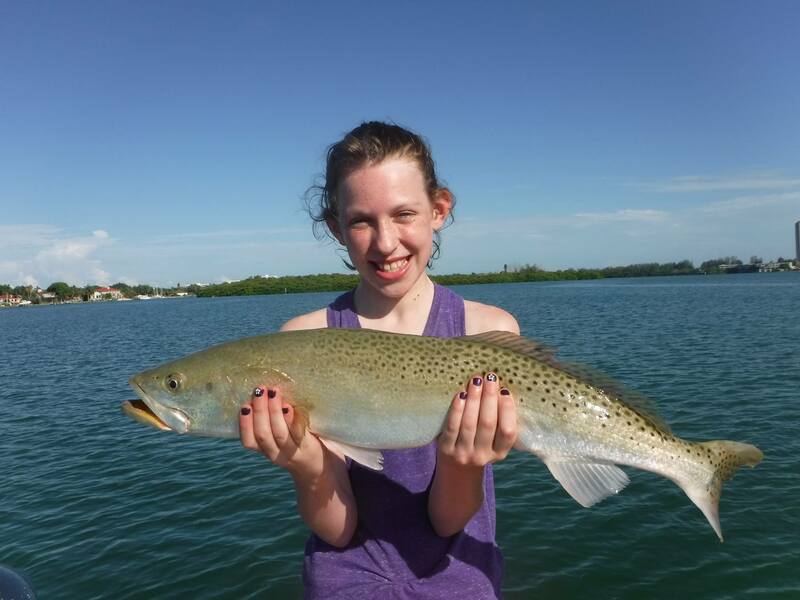 Whiole blues are rarely targeted, they are a most welcome surprise for clients on Siesta Key fishing charters when fishing for trout and other species. Bluefish fishing is at its best when they are seen terrorizing baitfish on the surface. When this occurs, just about and lure cast into the frenzy will draw a strike. Jigs are a good choice as the single hook allows for an easier release. While plugs work great, blues have razor sharp teeth and will quickly bite off an expensive plug. Steel leaders will reduce cut-offs, but will also reduce the number of strikes in the clear water. Fly fishermen also enjoy this great action. A Clouser Minnow is a very productive fly, though any baitfish pattern will catch bluefish and other species. An intermediate sink tip line works best. Florida regulations can be found HERE.